Astek Cranes Australia - Crane Hire Brisbane is an all Australian Company. We have been registered since 11th January 2002 and provide crane hire services to clients all over Brisbane. Our Team has many years of industry experience. The team include specialists in the construction industry, such as crane drivers, riggers, dogmen and supervisors. We have a strong focus on customer satisfaction. You will find that all jobs we complete are done professionally, on time and on budget. To request a free, no obligation quote please phone (07) 3701 5453. The whole team at Astek Cranes Australia - Crane Hire Brisbane have a wealth of experience in crane hire. Added to that, every staff member holds their relevant trade tickets. We've worked on projects that have been difficult and unusual. If you have a project that is out of the ordinary and need a crane hire company with experience to complete it, contact us. We'd be more than happy to provide a free, no obligation quote. Call us on (07) 3701 5453. Why choose Astek Cranes Australia - Crane Hire Brisbane? At Astek Cranes Australia - Crane Hire Brisbane, we deliver professional crane hire services on time and on budget. The team at Astek Cranes Australia - Crane Hire Brisbane pride themselves on ensuring the safety in every job. As such, all our workers hold all their necessary trade tickets. If you need the crane hire services from a professional company in Brisbane, you've come to the right place. To request a free, no obligation quote please phone (07) 3701 5453. Alternatively, fill out the contact form on the right and we'll contact you. 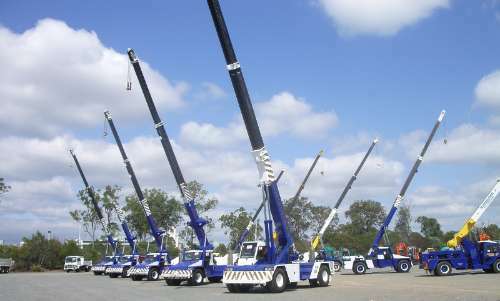 Being compact and mobile, Franna Cranes are the popular choice for mobile crane hire in Brisbane. They are able to fit almost any size construction project and are a better alternative to mobile truck cranes as the Franna crane setup time is quite efficient. Astek Crane Hire Brisbane offer one of the largest range of mobile cranes for hire. We have some of the best prices on Franna crane hire with a great safety record and our prompt and professional service. Being compact and mobile, City Cranes are a popular choice for mobile crane hire in Brisbane. As the name suggests they are designed to be used in an urban setting. Being roadworthy they are able to quickly attend a site but still offer a large amount of lifting capacity with outriggers on the front and back. Our city cranes are able to fit almost any size construction project and are a better alternative to small tower cranes as city crane setup time is quite efficient. Astek Crane Hire Brisbane offer one of the largest range of mobile cranes for hire. We have some of the best prices on City crane hire with a great safety record and our prompt and professional service. City cranes are one of our most in demand in our fleet of mobile cranes. The compact size and increased mobility of city cranes make them the perfect choice for the next time you have a tricky lift. They are ideal for use within Brisbane city for commercial jobs. Astek Cranes, hire out and operate City cranes in the greater Brisbane area including Ipswich and Logan. Being easy to set up and ideal in narrow spaces, not to mention they are one of few cranes that can legally drive through the narrower streets found within South East QLD, our City Cranes can do almost any job either commercial or domestic. Our All terrain cranes are specifically designed for operation in job sites where other mobile cranes cannot operate. Our all terrain cranes are fitted with off-road tyres and an all wheel drive suspension system that allows access to the toughest of job sites. As the name suggests they are designed to be used in any terrain also being roadworthy we can quickly attend your job site. Whether you’re working a job with unaltered surfaces or no road access at, all hire our all terrain cranes to do the job!! With the crane outriggers based at the front and rear we can create a stable lift in nearly all environments. All Terrain cranes are the heavy lifters in our fleet of mobile cranes. The mobility of our all terrain cranes make them the perfect choice for the next time you have a big lift. They are ideal for use within Brisbane city for commercial jobs with up to 60 Tonne cranes in our fleet . Here at Astek Cranes we hire out and operate all terrain cranes in the greater Brisbane area including Ipswich and Logan. Being easy to set up and able to work on any surface, our all terrain cranes can do almost any large commercial or domestic job.